that provide an immediate, positive impact in our community. The same businesses, individual, and foundations get asked to fund pretty much every community project. 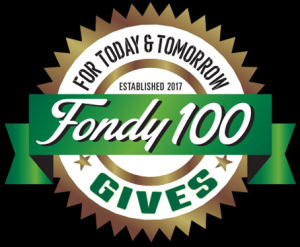 Fondy 100 Gives is an opportunity to demonstrate that people in the community appreciate their generosity and also want to step up and start supporting community projects. Fondy 100 Gives shows we are all here to help to make this community the best it can be! Fondy 100 Gives meetings are being planned at interesting sites, some, not always accessible to the general public. Meetings will start promptly at 5:00PM with an opportunity to purchase a beverage and socialize with other members. Innovative and inspiring speakers will be chosen to provide a 15 minute presentation to the group. Following the speaker, members will get to hear about three community projects presented by aspiring representatives from our local non-profit community. Each presenter will be limited to a five minute presentation with an additional five minute allowance for member questions. Following the live presentations, members will each be allowed to vote on the project they would most like to see funded. Voting will take place in a “survivor-type” area where votes will be cast anonymously. You will receive a token upon registration that you will deposit into the project “bowl” of your choice. The project that receives the most votes will be announced immediately following the vote. Number of votes received will not be disclosed. The meeting will end at 6:30PM. At 100 members, each project funded will receive $7500 with $2500 added to build the Fondy 100 Gives endowment fund for future community projects. If paying by credit card, please add $3.00 per $100 to your donation amount ($12 if paying the full $400) to cover the credit card processing fees. We need to have the full amount available for our projects. Bill pay may also be used. Your payment must be received at least three weeks prior to the scheduled meeting. Failure to receive payment by the due date could result in termination of membership. We currently have 100 spots filled for the Fondy 100 Gives, but we have already begun forming a waiting list for the 'Next 100'...if you are interested please fill out the registration form or give us a call.